Alex de Minaur has summoned every bit of his fighting spirit to win a five-set thriller against Swiss qualifier Henri Laaksonen and progress to the Australian Open third round for the first time. 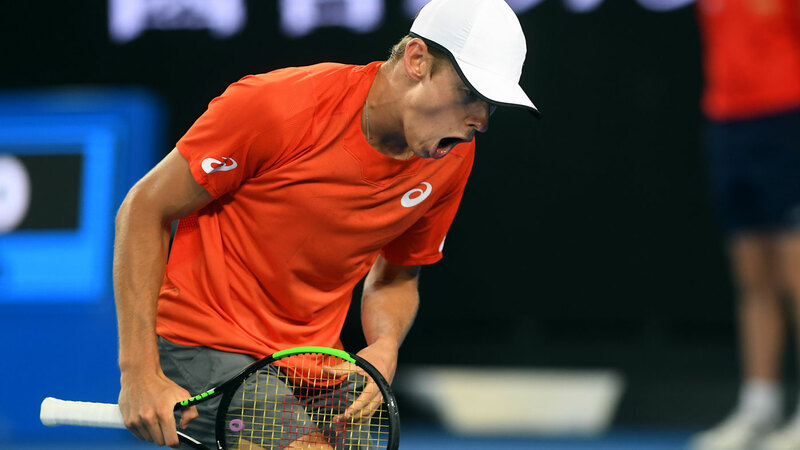 The 19-year-old Sydneysider was on weary legs heading in the deciding set on Wednesday night but rallied in front of a raucous home crowd to triumph 6-4 6-2 6-7 (9-7) 4-6 6-3. His reward for the round-two win in three hours and 52 minutes is another showdown with 17-time grand slam winner Rafael Nadal who beat him in the third round at Wimbledon last year. The youngster was firmly in control in the first two sets and looked to have a straight sets victory in the bag, but Laaksonen showed some of de Minaur’s fighting qualities with a dogged performance to send it into a deciding set. De Minaur got off to a flyer taking the first set 6-4 with the baseliner breaking Laaksonen in the first game of the match, wearing down the world No.93 with powerful groundstrokes and some deft shots at the net leaving Laaksonen with a huge unforced error count. The Australian kept the pressure on in the second with some well timed winner and finding another gear to force the Swiss player into more mistakes. Laaksonen hit back in the third with the Swiss player breaking the de Minaur and taking a 4-1 lead. The world No.93 gave the Australian a dose of his own medicine with sublime touch from the back of the court keeping de Minaur guessing from point to point. But true to form, de Minaur displayed his trademark fighting spirit and broke back in the seventh game of the third set and then held his serve and levelled the match at 5-all, forcing Laaksonen to play defensively. The home crowd hero kept the fight going though, forcing the third set into a tiebreaker, but unforced and forced errors hurt him and Laaksonen hit back to take the third the set 7-6. Laaksonen went into the fourth set growing in confidence and had the chance to really trouble the Australian’s serve but blew several chances in the final frame. Yet de Minaur couldn’t capitalise on Laaksonen’s mistakes and the Swiss star took the fourth to force it into a fifth. De Minaur managed to claw his way back in the final set after breaking his opponent in the first game of the decider but Laarksonen wouldn’t go away and pushed the Aussie all the way deep into the fifth set.